Lucky MI6 readers can win paperback copies of the new Young Bond novel "Double Or Die" by author Charlie Higson. Thanks to our friends at Puffin, MI6 can bring you a great competition to copies of "Double Or Die" - the third novel in the Young Bond series by Charlie Higson. "Double Or Die" - Copies To Be Won! 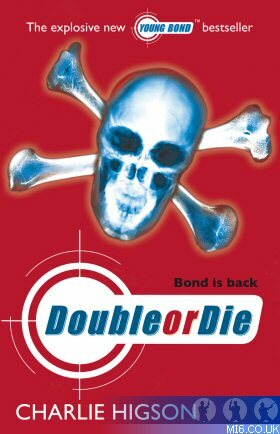 MI6 has paperback copies of "Double Or Die" by Charlie Higson to give away to lucky readers. Which title was NOT included in the voting list for Young Bond 3? The competition closes at midnight on 2nd March 2007. MI6 will choose the winners at random from the correct answers received. The winners will be contacted via the email address supplied and their postal address will be requested. If a winner fails to respond within 7 days of prize notification, another winner will be chosen until all prizes are allotted. Competition is open to UK based MI6 readers. MI6 is an unofficial non profit website that is in no way associated or linked with MGM, United Artists or EON Productions. James Bond 007 are registered trademarks of DANJAQ, LLC, a Delaware corporation in the United States and/or other countries. Original content is copyright mi6-hq.com © 1998-2007.